As a freshman in high school Lexie Gerson had a tough decision to make. Since she was eight years old, she had broken records as a swimmer but had also played basketball on several championship AAU and travel teams. By the eighth grade she was receiving recruiting letters from college basketball coaches. Both sports were the same season and she knew if she wanted to be a Division One athlete in college she could only pick one. Basketball was her choice because she liked the team aspect of the sport. It was the right choice. Gerson attended high school at the Peddie School in N.J. where she started on the nationally ranked girls’ basketball team all four years. She garnered national attention and was ranked 24th best girls player in the nation in her senior year. She was invited with a select group of girls to attend the United States Olympic Development Camp in Colorado Springs. 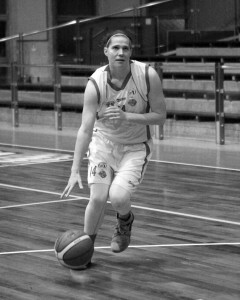 Named to the 2008 and 2012 USA Maccabi Open Women’s Basketball Team, Gerson was the only high school player chosen in 2008. Gerson accepted a full scholarship to play basketball at the University of Virginia. While playing at UVA she made the ACC All Defensive Team her junior and senior years leading the ACC in steals both years and in the top 20 for steals nationally. She is ranked fifth all time at UVA with 257 steals. She won the Thomas J Ryan Scholarship her junior and senior years. The scholarship is presented to a hard-working player committed to success; a team player who shuns the spotlight in favor of her teammates; a player who believes in family values and shares those values with her team. Gerson was also named to the ACC All-Academic Team her senior year. While at UVA she received her Bachelor’s Degree and a Master’s in Education. Based on the considerable community service she performed throughout her college career, Gerson was nominated to the WBCA Good Works Team. Since college, she has been in Israel playing basketball professionally.